In October 2004 Integra Investments, in association with the Rapid Transport group, announced a new concept in commuter air travel in New Zealand. 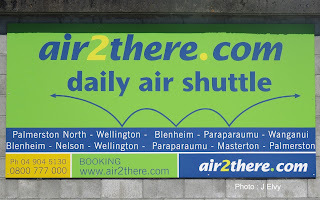 The airline, which was to be called Air2there, was to be based in Paraparaumu and the company’s plan was to operate a city-hopper air service from Wellington to Masterton, Paraparaumu, Blenheim and Palmerston North. Murray Cole, the chairman of Integra Investments said, "We have probably got more (airports) per head of population than anywhere else in the world because of a wonderful Ministry of Works in the 1940s. Then every little town wanted its own airport and now they are under-utilised and yet we have problem with the roads being clogged up." At this stage Integra Investments was already a substantial shareholder in Paraparaumu and Palmerston North airports. The Rapid Transport group was an Auckland-based transport company and its subsidiary companies included Rapid Delivery, Waikato Freight, Ivory Freight and Pronto Parcels. 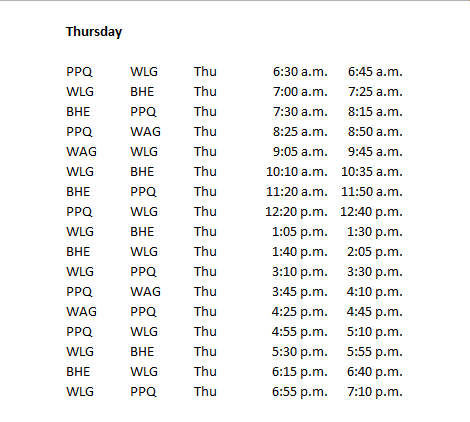 Flights were scheduled to connect with international departures from Wellington and Palmerston North airports and with ferry crossings from Wellington. The company selected a Cessna 208B Grand Caravan to operate the service stating that they only needed about three passengers to break even. 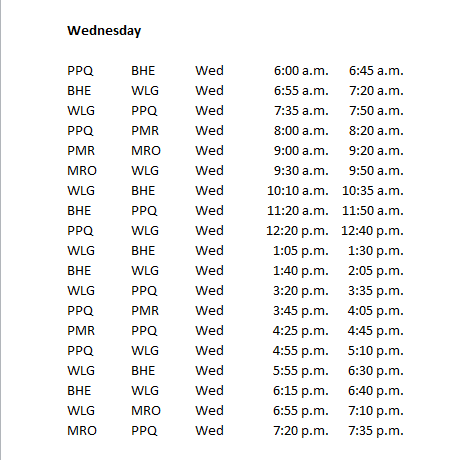 Murray Cole said, "If we can get sufficient patronage we can increase the frequency so it could get to the point where people would know there was a flight from Wellington to Blenheim every hour and even if they hadn't booked and it was full they would just have to wait an hour for the next one. With internet ticketing, people wanting to travel between the five centres will be able to walk onto the aircraft. There is no check-in processing or having to turn up to a terminal building 30 minutes before departure, and for many connections, travellers will arrive at their destination 20 minutes after take-off." 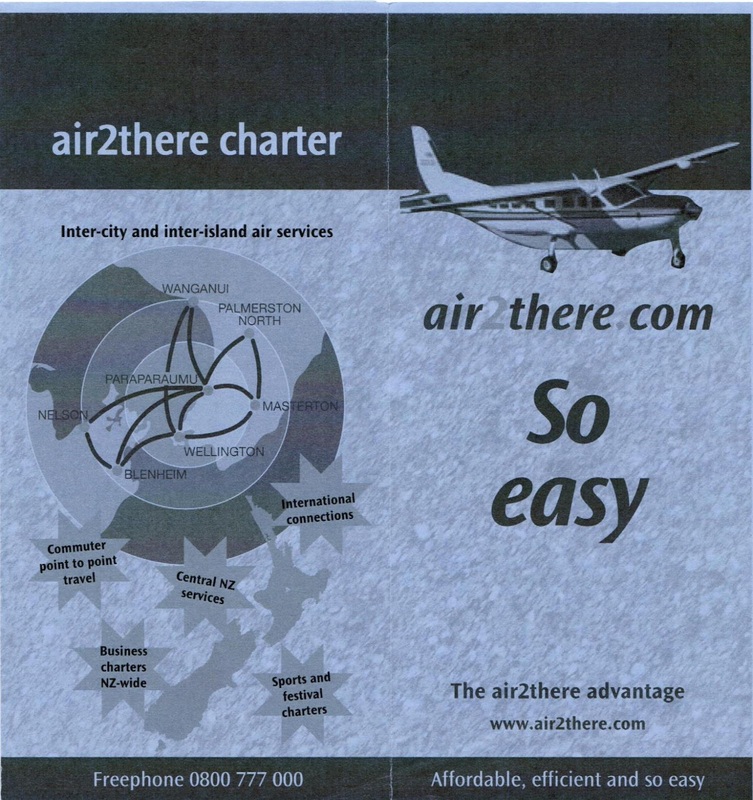 Air2there was officially launched on the 19th of November 2004 but gaining the necessary Civil Aviation Authority operators certificate took longer than expected and scheduled flights did not commence until the 22nd of December 2004. Licencing issues meant that the Cessna 208B Grand Caravan ZK-MYH (c/n 208B0604) was initially only able to operate under VFR and so Piper Pa31-350 Chieftain ZK-MYS (c/n 31-7652032) and Vulcanair P-68C ZK-MYO (c/n 417) operated the early IFR services. 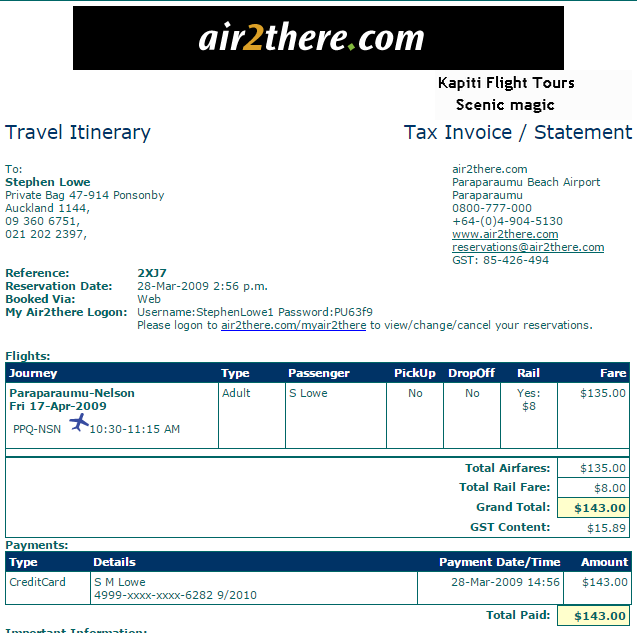 At the time of the launch a 20-trip single-sector ticket, booked online, cost $28 per trip, a 10-trip-single-sector ticket cost $46 per trip and a single-section ticket cost $56. Shuttle buses provided door-to-door service on the Kapiti Coast and in Marlborough, for an additional $10 per passenger. The original network at the launch in December 2004. 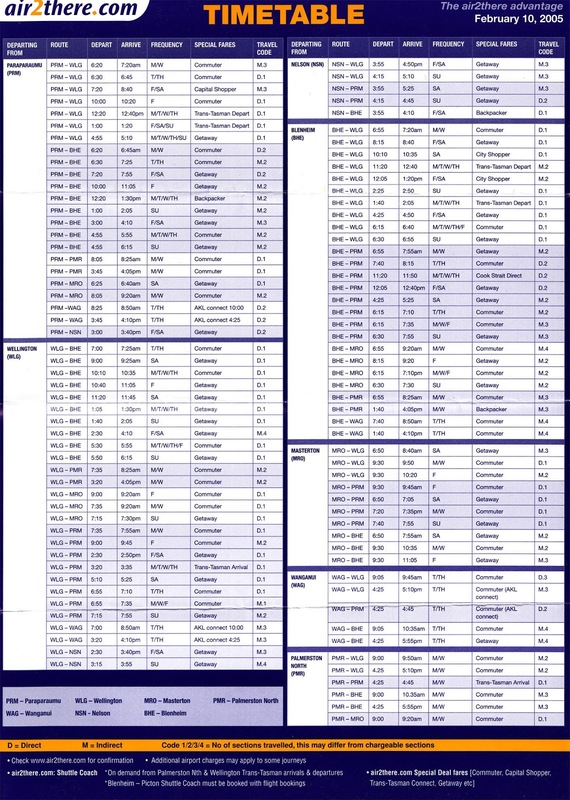 Thrice-weekly services to Nelson were started on the 11th of February 2005 and flights were also started to Wanganui. However, the concept of the city-hopper air commuter service did not take-off and by the end of 2005 Masterton, Palmerston North and Wanganui all were cut from the network due to a lack of patronage. 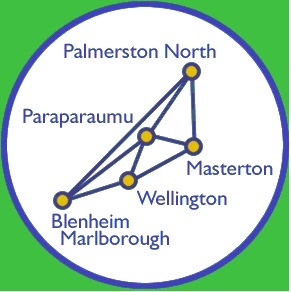 With Wellington airport at the southern end of the urban area and wanting to tap into the large population from Porirua northwards air2there.com partenered up with TranzMetro, the greater Wellington electrified rail network operator, in June 2007. This allowed air2there.com flight tickets to be purchased with an add-on for travel to or from Paraparaumu station from any other electrified network TranzMetro station on the one ticket. Shuttle transport between the station and the air2there.com airport terminal was initially included to facilitate ease of transport. 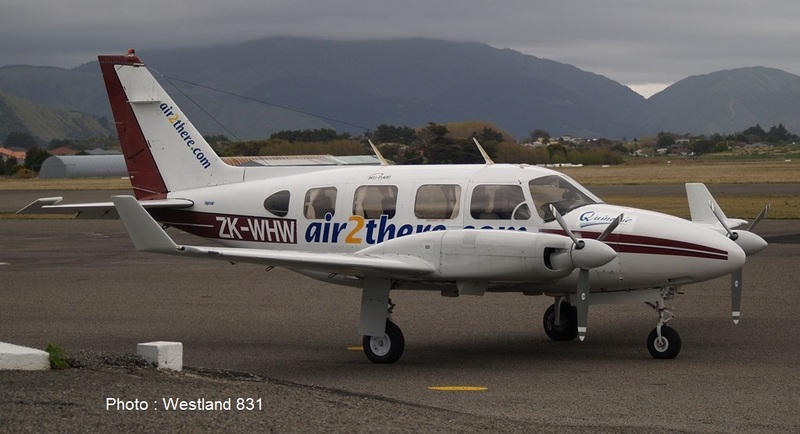 In August 2008 Richard Baldwin, who had been managing air2there and who was also the Paraparaumu airport manager, bought the company which was renamed air2there.com (2008) Ltd. For a couple of years prior to this air2there had been using his Piper Pa31 Navajo, ZK-WHW (c/n 31-437) on its services. Over the years articles in the Dominion Post indicated air2there’s innovation in making itself known for flying unusual passengers, including Wellington SPCA puppies being flown to Nelson and Blenheim to find new homes, coffins being flown between Nelson, Blenheim and Wellington and further afield, by offering prisoner transfer flights for the Corrections Department and shuttle services for the RNZAF between their bases at Woodbourne and Ohakea. By May 2010 airthere were operating thrice daily flights from Blenheim to Wellington 22 May 2010, though one of these services back to Blenheim operated via Paraparaumu. The company also added a second flight between Paraparaumu and Nelson each Friday. In August 2010 the company added more flights between Paraparaumu and Nelson, giving a total of 10 direct flights per week. 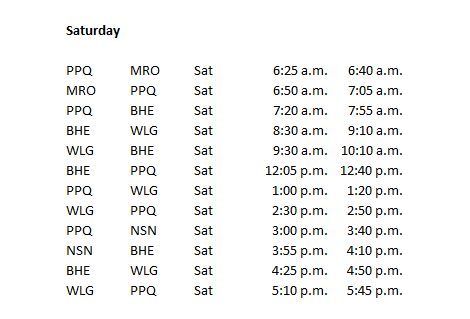 At this time air2there also operating two return flights daily between Paraparaumu and Blenheim. 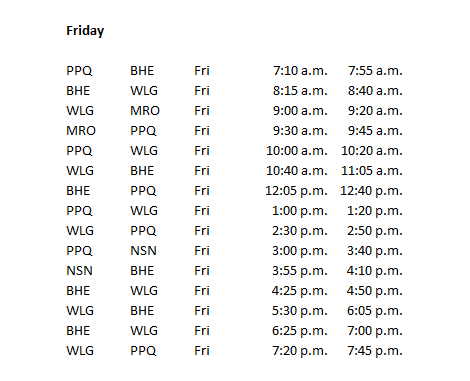 In August 2011 Sounds Air added 13 additional flights between Blenheim and Wellington. 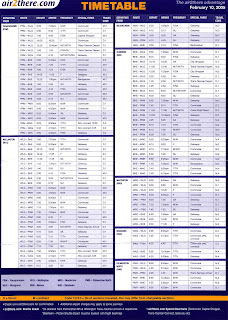 Sounds Air’s standard fare was cheaper than air2there.com and all but the cheapest Air New Zealand's fares. Over the next two years the impact of Sounds Air eroded air2there’s traffic out of Blenheim. For a brief time the air2there website announced the company was code-sharing flights between Blenheim and Wellington with Sounds Air. When this arrangement ended flights were further reduced and by August 2013 flights between the two centres were offered on Mondays, Fridays and Sundays only. 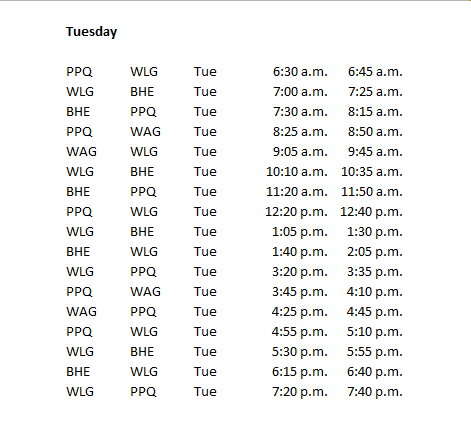 In late-October/November 2014 air2there withdrew all services on the Wellington-Blenheim route. This left the company servicing a Paraparaumu-Blenheim-Nelson Paraparaumu triangle which the company continues to fly twice each day. In May 2013 air2there moved its scheduled flights to Paraparaumu's new Kapiti Airport Terminal. Bookings and enquiries could be made at the new terminal while the administration base and general offices remained at the old Kapiti Road site. Within a few months, however, the airline had returned to its own terminal. In May 2013 air2there added a Beech 200 Super King Air to their fleet. ZK-MYM (c/n BB-1466) is used for a joint venture air ambulance operation with Helipro for the Manawatu district. 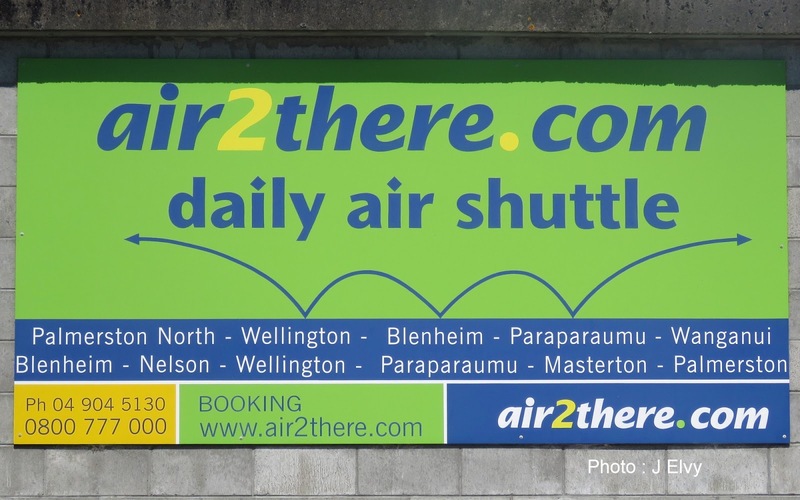 Air2there faced new competition from late January 2015 when Sounds Air introduced thrice daily weekday flights between Paraparaumu and Blenheim in competition with its own services. 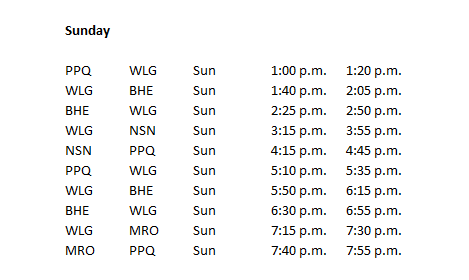 Sounds Air did not pick up the traffic anticipated and they reduced their schedule. Air2there's Cessna Grand Caravan ZK-MYH arrives into Woodbourne on 23 February 2017. The artwork guiding the plane on its journey was gifted to air2there by the local iwi. In March 2016 Originair ceased flying with the withdrawal of Inflite Charters. Originair remained grounded for some months before they resumed services on the 23rd of September 2016 using air2there aircraft. In the months following air2there operated the four times weekly direct service between Nelson and Palmerston North with Piper Chieftains and the Cessna Grand Caravan being used. Originair resumed Jetstream operations on the 30th of June 2017 with BAe Jetstream 31 ZK-JSH operating the Friday afternoon flights, OGN 3215/3216 from Nelson to Palmerston North and return, being operated by air2there using the callsign AIR2THERE 7. On the 23rd of October 2017 air2there's Cessna Grand Caravan ZK-MYH operated the company's triangular route to Blenheim and Nelson and then went to Palmerston North for heavy maintenance. 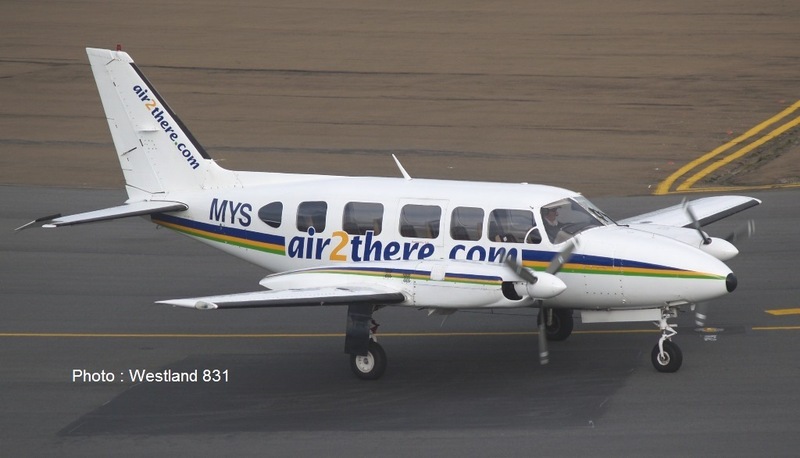 It later transpired this was the last time ZK-MYH operated for air2there. From the 23rd of October air2there used Originair's Jetstreams to operate their services, though occasionally the Beech Super King Air ZK-MYM was also on the scheduled service. Air2there also continued to operate Originair's services between Nelson and both Palmerston North and New Plymouth on their behalf. 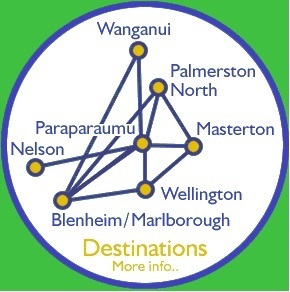 By mid-2018 the triangular service from Paraparumu to Blenheim and Nelson was only operating on Fridays and Sundays. Air2there's final scheduled services were flown on the 4th of June 2018 in Jetstream ZK-ECI. On the 10th of September air2there's Beech Super King Air ZK-MYM was flown to Napier and remained there. The company stopped operating on the 13th of September 2018 following suspension of the air operator certificate by the Civil Aviation Authority. The final Originair services that air2there operated in Originair Jetstreams occured on the 12th of September 2018. On the 25th of September and the 13th of November 2018 applications were filed in the High Court to put air2there.com (2008) Ltd into liquidation. Air2there's Cessna Caravan ZK-MYH was listed as for sale and the company's website closed down. The company was finally put into receivership on the 27th of November 2018. The receivers have identified three aircraft together with various parts and equipment as part of the company's assets. Will Napier be Sounds Air's Next Destination? Beech 1900D ZK-EAM back in service!